The “Csiki Garden” is a Medieval eco-archaeological park and Summer camp (in Hungarian: Csiki Pihenőkert, Árpád-kori régészeti park, erdei-iskola és nyári tabor) coordinated by the Régiségbúvár Egyesület (Antiques-research Association). The goals are to present Hungarian medieval life and history (buildings, agriculture, craftsmanship, foods, arms, costumes, et cetera) as well as teaching the children in schools and in Summer camps. The idea is to promote the preservation and raise awareness of local cultural heritage and traditions, basically focusing on youth and families. To serve this goal, educational, cultural, sports and recreational programs are organised, effectively contributing to cherish our past and traditions by means of publication and dissemination. The basis for “Csiki Garden” is a specific site: a medieval village (named “Csik”) was excavated in 2002 and reconstructed in this place. The association itself excavated the old village, and then decided and designed the reconstruction. The local government and some sponsors financed this idea. The garden truly is a green area. The nature of living processes, the development of awareness of complex ecological approach to development and conservation aims to highlight the importance of the forest school programs carried out. Archaeologists were involved from the very beginning, just like historians and restoration experts. Every year staff tries to build Medieval houses and the special nomadic tent (“jurta” or yurt) with old original tools and materials. There is a medieval gardens and animals, and old-fashioned kilns are used for bread and pottery making. In Summer camps the children live in this old village. The village is a tourist and educational local institution. Experimentation and (re)construction activities, in cooperation with the MTA Archaeological Institute in Budapest, PMM involved the construction of ancient building types with authentic materials and techniques, and later the examination of their use and decay, constructing industrial and household furnaces, using and testing them, examination of tools, researching raw materials, planting and testing of ancient crops, Glass production experiments and cooking and tasting prehistoric, ancient and medieval meals. The association too organises exhibitions together with necessary installations, reconstructions, models and costumes. The work out museum pedagogical and school forest program modules and presentations, practical training of museum pedagogues in cooperation with ELTE PPK. The members of the Antiquarian Youth and Cultural Society are professional archaeologists, museum professionals, pedagogues, business or technical professionals, pensioners and students, who together with their families, are interested in learning about our past, and are enthusiastic and active people. The association has won several awards for its combination of research and education and hosted an important conference in 2007 about environmental and experimental archaeology, museum educational facilities in Hungarian archaeological parks, scientific and demonstration days. The education and cultural institution functions organically link to the Archaeological Exhibition of the City Budaörs „ Living Museum” program. All year round there are cultural, handicraft and traditional events, as well as museum educational programs. During the Summer there is an offer of day care and/or boarding turns on a weekly basis for vacationing children who are provided accommodation in the yurt village. These Summer camps have alternating themes every week: an archaeologist camp, art camp, conquering nomad camp and Indian camp, during which the person may experience the life of ancient times. The costume games and the handicraft workshops involve a lot of sport. The continuous development over the last few years led to many new buildings made to fit the programs: an Indian village, a wooden castle with the castle theatre, playground, pottery, bread oven, sand and grass sport-fields, archery court, swimming pool and fish pond. Accommodation in the yurt village and in the camping part is available for one or more days. There are 6 yurts, maximum 50 people). The whole site includes all facilities needed. The yurts are water resistant, with wooden floor and carpets. 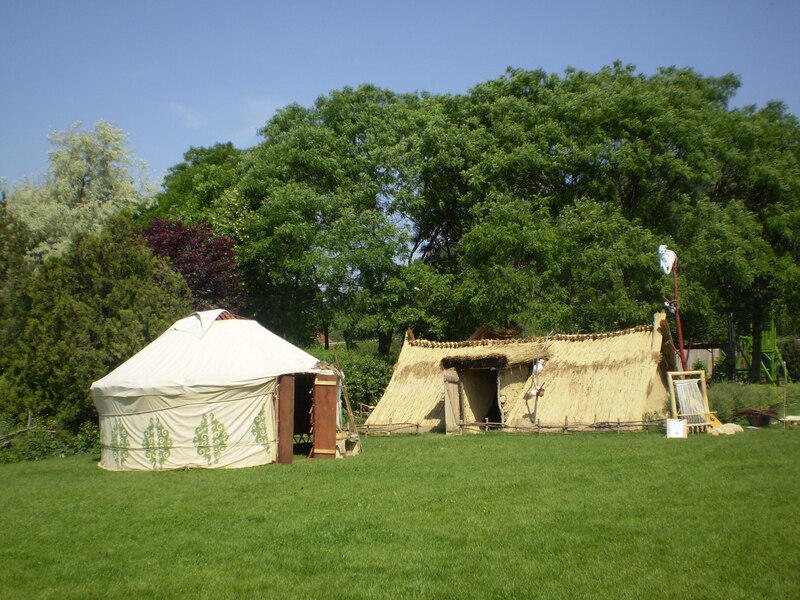 • Interactive discussions and presentations in the yurt and in the Indian village, getting to know and trying on contemporary clothes, weapons and everyday tools. Practising ancient runic writing. • Handicraft workshops: pottery, planking, spinning-weaving, preparing costume and jewellery, wood carving, making jewellery et cetera. • Getting to know plants indigenous in Europe and America, cooking, grinding grain and baking quiche. Discovering herbal teas. • Shaman dance, learning drums, singing and dancing around the camp fire. • Archery, trace reading and navigation skills (using compass and maps). • Costume drama game, processing of the Hungarian historical legends in the Castle Theatre. Performing ancient tribal Indian myths, body painting, and making totem poles. • Exploring the tricks of professional archaeology: excavation and restoration practice, anatomical knowledge in the graves. I was born in Budapest in 1971; I graduated at the Eötvös Loránd University (Budapest), Faculty of Humanities, Archaeology Studies, and in the University of Pécs, Faculty of Law. I worked in the Budapest History Museum and in the Pest County Museums Authority, my special research themes were the medieval ages and the glass manufacturing. Beside the excavations I organise popular scientific events, museum pedagogy programmes, Summer camps, interactive exhibitions and books for children. In 2002 we excavated a medieval settlement (which name was Csik) in Budaörs, where the Local Municipality sponsored the built-up of an archaeological park (Csiki Garden). The education and cultural institution functions organically linked to the Archaeological Exhibition of the City Budaörs " Living Museum" program. The Antiquarian Youth and Cultural Society members designed, built and operated both institutions. I'm the chairman of this civil Society and the director of the two local museums. I am the manager and the program-organizer of the Archeological park. I graduated at Corvinus University, Budapest the faculty of Economics, Management. History is my passion and my task is to find the best way to deliver it to the people. So with that, I am responsible for programs, local events, historical festivals, summer camps and international connections as well.